At Smith, the author learned the importance of spending time to "go pick apples and enjoy your friends." If I had to pick one lesson from my years at Smith, I wouldn’t choose a lesson from a class. I’d choose the lesson I learned about time, and the importance of what you do with it. I came to Smith as a high achiever who was determined to stay that way. I scheduled my way out of a lunch period my senior year of high school because there was never enough time for everything I wanted to do. Despite my high stress, I loved learning, and Smith, with its flexible course requirements and wide-ranging options for study, looked like a playground to me. Reading the course catalog was like reading the lid of a chocolate box: so many delicious things to choose from! I came in determined to major in theatre and dance and minor in neuroscience, even though they seemingly had nothing to do with one another. And that’s exactly what I did. Not surprisingly, with two areas of study that didn’t overlap, time was at a premium. I was back to scheduling myself out of that lunch period. Fast forward 20 years after graduation: I was using a leftover notebook from my stage lighting class at Smith; frugal to my bones, I had carried that bit of blank paper with me. The notebook fell open to an old to-do list on the last page. I love to-do lists, and I laughed at this one from my college days because, out of 18 items, I had crossed off only two, the easiest items on the list. The list looked weighty and important, like these tasks were crucial to my survival. Yet even with all those items left undone, here I was, healthy, happy and doing just fine. Looking at the list and thinking about my time at Smith, I found myself remembering a particular day in the fall that first year. My house, Washburn, had arranged an apple-picking excursion. I wanted to go, but I had a list! A long list, full of so many things to do! I can see myself at 18, wide-eyed and panicked with my list. My housemates somehow talked me into going anyway. We picked bags and bags of apples that day. The air was crisp, the apples were delicious and we picked more than we ever could have hoped to eat. We enjoyed each other and the day, and we ate apples until we were sick of the smell of them. I have no idea what was on my list that day that I was so sure I couldn’t leave undone, but I remember my friends and the apples and the crisp fall day. Later, a month before graduation, my housemates and I were in a panic. We had long to-do lists and not enough time. With a sense of desperation, we created countdown calendars that we posted on our doors in our Friedman apartment. Each day, we marked off a square. Every day, no matter what we accomplished, one square disappeared. 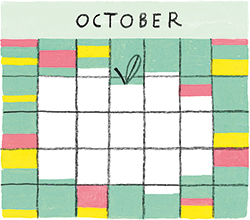 By the end of the month, all the squares were crossed off. Whether we completed the items or not, the time was gone, all the time we had at Smith. We all graduated and went on with our lives. I appreciate the education I got at Smith and the time spent among smart, talented women. But 30 years later, what I remember is a time that was precious, full and finite. I never wrote “Go pick apples and enjoy your friends” on a to-do list, but when I write those lists now, I leave plenty of space for both the friends and the apples. J. Autumn Needles ’89 writes for EDGE Media Network and is a Pilates instructor and trainer in Seattle. 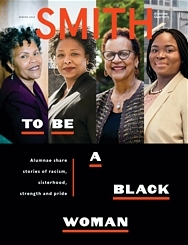 Have a story about how Smith has influenced your life? Send your 600-word essay to saq@smith.edu for consideration.